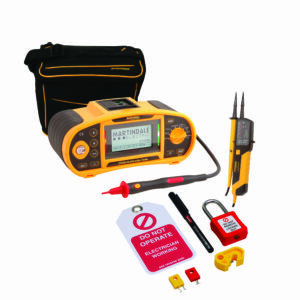 The special edition kits, which are available with either ET4000 or ET4500 rechargeable multifunction testers,include a free Martindale VT25 Voltage and Continuity Tester and a Martindale LOKKITBASE. Offering considerable time and cost savings, the kits fit conveniently in the Test and Go carry case, which has been designed to allow testing without having to unpack and repack the instrument. Martindale multifunction testers simplify 17th Edition testing by having the latest Zs loop impedance values built-in together with red and green LED indicators for instant pass/fail results. Designed to make testing simple, the ET series of multifunction testers include the capability to display all results from an RCD auto test on one screenand useful Help menus available at the press of a button. On connection, the testers carry out an automatic polarity and wiring check, to identify any potentially dangerous wiring faults in advance of any testing. The Martindale VT25 is a tough and compact two pole tester for measuring AC/DC voltages from 12V to 690V. Additional capabilities include continuity and phase rotation testing plus single pole voltage detection. The AC/DC voltage detection, continuity and phase rotation functions all have bright LED indication. Auto power-off also ensures a long battery lifetime. The VT25 conforms to all the latest safety standards and includes removable probe caps for GS38 compliance. Additional safety features of the VT25 also include a 1.2m double insulated cable with a black outer and contrasting inner core to give users a visual warning of any damage. And a built-in white LED torch to make it easy to use in low light environments. Included as part of the ET Series promotional offer is the six piece LOKKIT BASE, which includes three different Martindale MCB locks, which cater for most standard MCBs. Suitable for performing safe isolation procedures correctly, as required by the Electricity at Work Regulations, the latest promotional kits from Martindale Electricinclude all the essentials for industry association approvals.